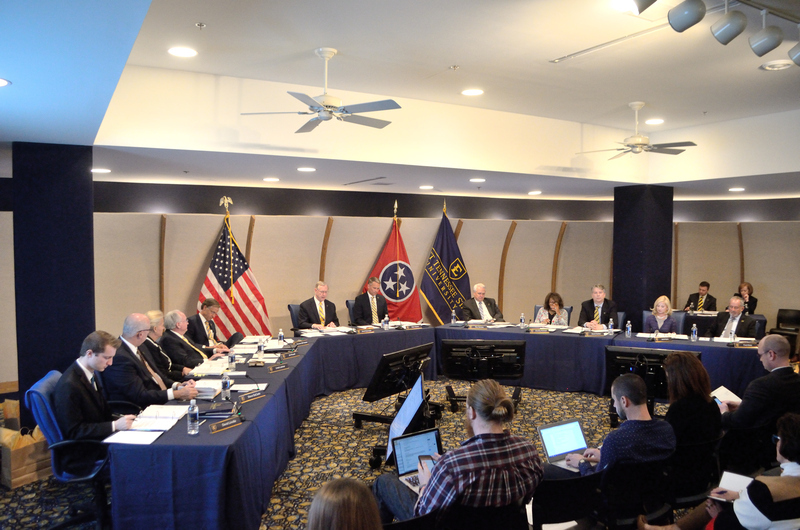 ETSU officially made the transition from the Tennessee Board of Regents to its own governing board on March 24, by establishing its calendar, code of ethics, bylaws, chair, vice chair and student representative. ETSU President Brian Noland had the honor of calling the first meeting to order in the East Tennessee room of the Culp Center at 1 p.m. on Friday. Various members of the faculty and staff, community members, a few students and media outlets were in attendance, but the star attendee was Tennessee Gov. 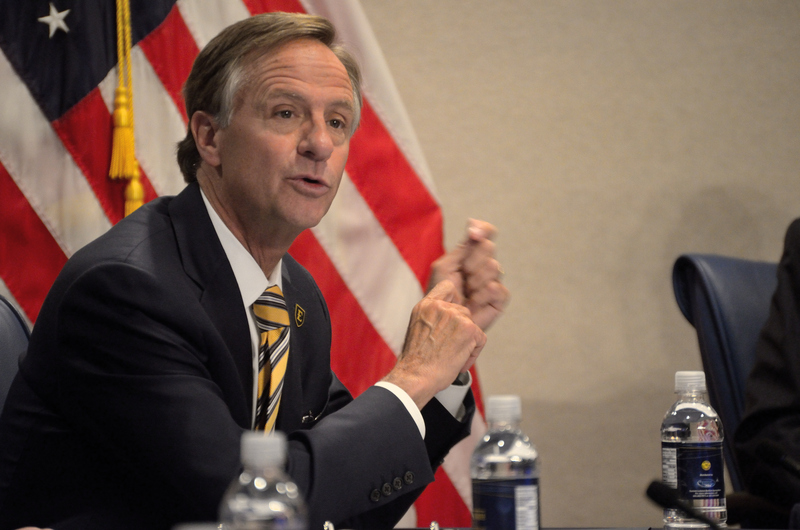 Bill Haslam. The board consists of eight voting members who have various connections to the university and the region. Janet Ayers, Steven DeCarlo, Dorothy Grisham, Dr. Linda Latimer and Ron Ramsey are all ETSU alums while David Golden, Scott Niswonger and Jim Powell are not. However, Niswonger and Powell hold honorary doctorate degrees from ETSU. Fred Alsop of ETSU’s Department of Biological Sciences will serve as the faculty representative for the board for the next two years. He was confirmed prior to the first meeting. Among the first items of business included the adoption of the bylaws, code of ethics and calendar, which all passed unanimously. Next on the agenda was the nomination and confirmation of Niswonger as board chair and Golden as vice board chair. Once Noland passed the gavel to Niswonger, he took the podium to introduce the nomination for the student representative of the board. Prior to the first meeting, the university reviewed applications and interviewed the top candidates for the position before ultimately deciding on the current SGA vice president, Nathan Farnor. “He was a star the moment he walked in the room that day, and he’s been a star ever since,” Noland said about the moment he met Farnor for the first time at Farnor’s Roan Scholars interview. The board eagerly and unanimously confirmed Farnor, who is not a voting member at this time. Currently, there is legislation moving through the Tennessee General Assembly that would give Farnor and the other student representatives at the other universities a part of the FOCUS Act a vote if passed. Chairman Niswonger did not state an opinion on whether or not he believes the student representative should have a vote, but he did mention what is practiced at his alma maters. In addition to establishing key elements of how the board will operate, the board was briefed on an immense amount of data and information about the university. Noland presented the history and goals of the Committee for 125; Bert Bach, the provost and vice president for academic affairs spoke on the accreditation history of the university; Michael Hoff introduced the university’s newly developed strategic plan and B.J. King, senior associate vice president for financial services and acting CFO, read the results of the internal financial audit. Board meetings will be held quarterly and are open to the public with a livestream available online. The calendar along with the meeting’s agenda and recording is available online at etsu.edu/trustees/default.php. The next Board of Trustees meeting will be June 9 at 1 p.m.